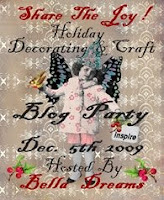 Here's something for Share the Joy the Bella Dreams Blog Party . Please make sure you stop by and say hello to all of the other participants of this beautiful event. Click the Badge on the right side-bar and it will take to the official post. Maybe not the most inspired idea you'll see, but it works for us. This is how I tag our gifts. I use Avery Labels 5069 (video cassette) and stick it on the package. You could use post card sized and print out a picture like this and hole punch for a large tie on.. Or just use a word program with copy and paste for the size you need. A paper cutter, punch or decorative scissors can make a fancy edge. Mine look a bit fancier than this but the Avery program wouldn't play nice with blogger. But you get the gist. One for each member of the family and even a three year old can help hand out Santa's gifts. This is a great idea! Thank you for sharing and HAPPY HOLIDAYS! I think that's a wonderful idea. Thanks for joining the party and sharing with everyone. cute idea (i'm dumb...never heard of an "avery program"?) but LOVE the idea! thanks for visiting me today! Erin...Sorry that's Avery Labels (they make all shapes and sizes. The software comes with them, you can do without but it's harder. Have a Happy Christmas.